Note The push service supports launching an application in the background. Remember that you can deliver application data to your application without an unwanted UI launch. EventHandlerStateChanged() is triggered when the connection state changes. EventHandlerNotificationReceived() is triggered when the push notification is received from the push service. The YOUR_PUSH_APP_ID parameter is the push app ID received from the Tizen push server team when the access to the server was requested. Keep this push app ID confidential, otherwise your push notifications can be hijacked by malicious applications. If the PushServiceConnect() method catches any exception, it means the connection to the service failed. This happens most likely when the push privilege is not added into the application manifest. If the connection with the push service succeeds, the application must request the unread notification messages sent during the disconnected state by using the GetUnreadNotification() method. Establish a connection to the push service when the application is launched and disconnect from the service when it terminates. The application can be resumed after being paused. To ensure that push notifications are handled fluently, the PushServiceConnect() method must be called when the application is resumed. When the application terminates or no longer uses the push service, close the connection using the PushServiceDisconnect() method. The PushServiceDisconnect() method returns all the resources allocated for the connection. The connection is automatically closed when the application terminates. Hence, if the application uses the push service while being launched, it does not need this method. The application can also disconnect the service in the middle of the application operation. If you add a toggle switch to the application for switching the push service on and off, call this method when the service is switched off. Do not call this method inside any event handlers, however, since it can cause the application to crash. The application can be paused by pressing the Home or Back key. For a proper push operation, the PushServiceDisconnect() method must be called when the application is paused. After the connection to the service is made, the application is notified whenever the connection state changes. This notification is conducted through the EventHandlerStateChanged() event handler. The following figure illustrates the possible states of the push service. If the application is currently registered to the push server, the service forces it to transit from the Initial state to the Registered state. In this case, the application can request deregistration from the push server using the PushServiceDeregister() method. If this request is approved by the push server, the state transits to Unregistered. If the application is not currently registered to the push server, the state transits from the Initial state to the Unregistered state. In this case, the application can request registration to the push server using the PushServiceRegister() method. If this request is approved by the push server, the state transits to Registered. In the above example, the OnStateRegistered(), OnStateUnregistered(), and OnStateError() methods contain the actions for the Registered, Unregistered, and StateError states, respectively. The application does not need to handle the Initial state, because it is maintained internally, and this event handler is never invoked in that state. The e.Error is the error message from the push service when the state becomes StateError. 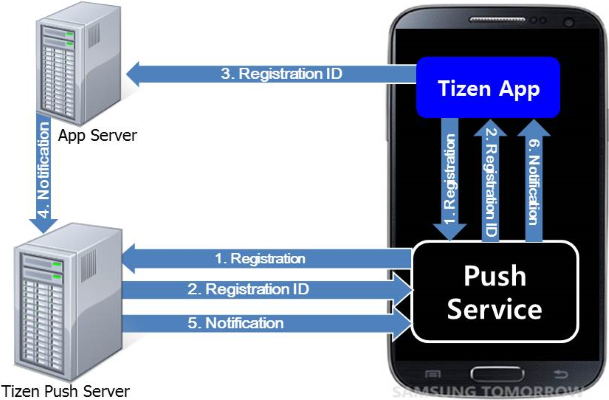 After connecting to the push service, request registration using the PushServerRegister() method of the Tizen.Messaging.Push.PushClient class. The OnStateUnregistered() method containing the PushServiceRegister() method is called when the state transits to Unregistered. This sample application is designed to send the registration request as soon as it is connected to the push service. If the application requires users to log in to the service, this registration request must be sent after the login process is complete. The registration request is non-blocking. If the push service successfully sends the request to the server and receives an approval, the res value is Success. When an error occurs in the middle of the registration process, the reason is returned. For example, if the push server is not responding, the ServerResponse res returns Timeout. In this case, the application does not need to request registration again because the push service keeps the previous request and sends it when the network becomes online. Request the unread notifications asynchronously. If there is such a notification, it can be received through the EventHandlerNotificationReceived() event handler after the OnStateRegistered() method returns. If the ID is new or updated, you need to send it to your application server. This ID is used as a destination address to the application on a particular device. If the application has already sent the ID, you can skip this step. Note The PushServiceUnregister() method is not used if the application is intended to receive push notifications continuously while it is installed on the device. When the application is uninstalled, the push service detects the event and deregisters the application automatically. On the other hand, if the application wants to receive push notifications only when a user logs in, the PushServiceUnregister() method must be called whenever the user logs out. The AppSecret is a key to accessing the push server for sending notifications. If notifications are sent from your application server, the application does not need to know the AppSecret at all. Keep the AppSecret on the server and do not load any related information in the application. If you want device-to-device notification delivery without your application server, the application needs the AppSecret to send a notification from a device. In this case, it is your responsibility to keep the AppSecret safe. The appID and appSecret values are given in the email message that you receive when requesting permission to use Tizen push servers. When the push service on the target device receives a notification with this message, it launches your application and delivers the notification. For more information, see how to receive notifications when the application is not running. When a notification arrives to the application while it is running (more precisely, while the application is connected to the service), the EventHandlerNotificationReceived() event handler is called. You can handle the received notification in the event handler. The following example shows how the application can retrieve the app data (payload), message, and timestamp from the received notification. When the EventHandlerNotificationReceived() event handler is called, you can retrieve the app data, message, and time stamp from e.AppData, e.Message, and e.ReceivedAt respectively. You need to set the action to LAUNCH in the message field when sending the notification from the application server. When the notification action arrives at the device, the push service forcibly launches the application and delivers the notification. By the way, when the application is launched by the push service, you need to determine the reason for the application launch and react to it appropriately. The push service provides launch types when the application is launched by the service. Use the following code to figure out why the application is launched in both cases of receiving notification and changing registration state. The difference between the ALERT and SILENT actions is that the former shows an alert message in the quick panel and changes the badge count, while the latter does not. If the user clicks the alert message in the quick panel, the push service forcibly launches the application and delivers the notification through the app control.